I’m still not ready to upgrade my NEC XG CRT Projector, honestly, what out there is better in my price range? Sure, an Electrohome Marquee 9500LC (about $10,500 used) or Sony G90 ($24,999 new) are, in my opinion, the two best CRT projectors out there… they’re just out of my price range. Those two beasts boast 9″ CRTs that are liquid coupled. A sight that needs to be seen to fully appriciate. While some might balk at the idea of paying top dollar for 1940’s analog based technology, CRT projectors still produce the best pictures around. This however, is slowly changing… see JVC’s new 3-chip D-ILA DLA-HX2E projector. 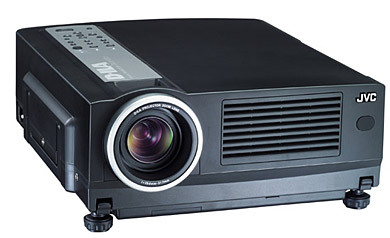 This projector contains three reflective, 1.1-megapixel WXGA-plus 16:9 D-ILA chips, which produce smoother, flicker-free, high resolution images. The results? More cinema-like images without any visible pixels or line structure… like CRT… or maybe even better? I’m still debating that question. The HX2E features a high contrast ratio of 1500:1, 4-color profile mode and true black reproduction. I was actually surprised that this projector wasn’t in the $30k range… you can pick one up for about $10k.